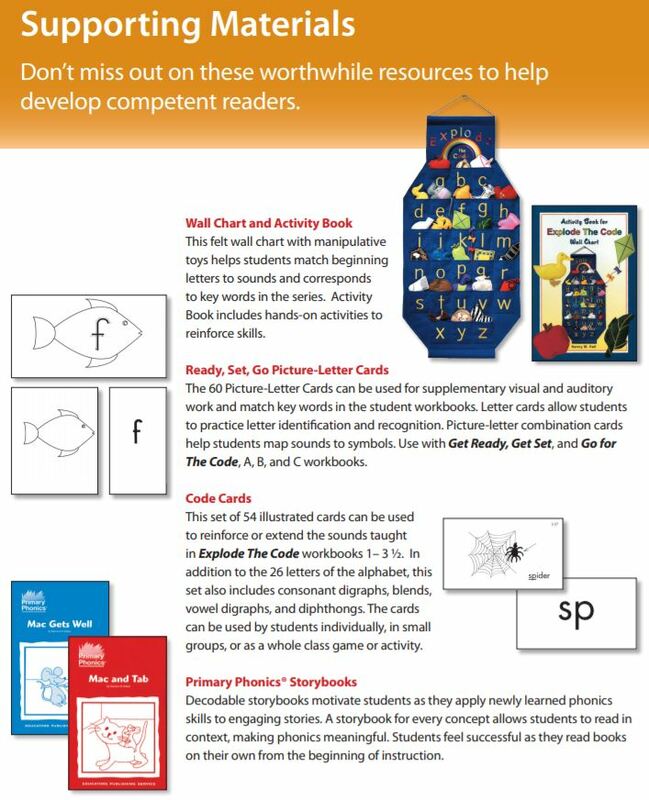 Before students can learn to read, they must be able to recognize letters. They must also be aware that the sounds of spoken language work together to make up words - that is, they must have phonemic awareness. 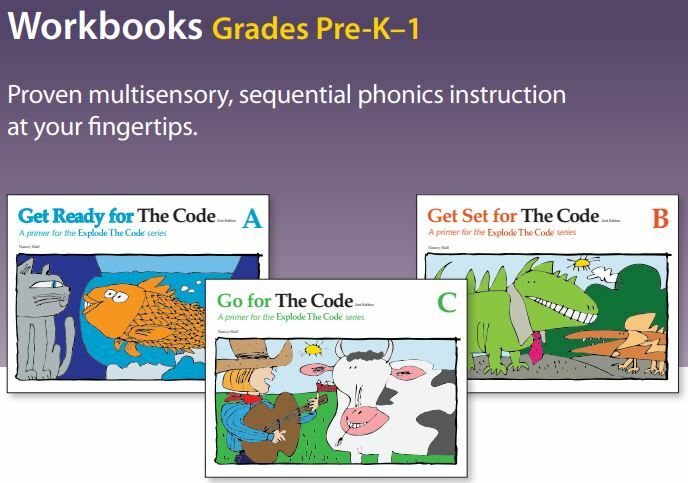 Go for the Code: Book C is the third and last book of three pre-literacy primers which together introduce all consonant letters; they are designed to be used before the Explode the Code series. Covering the sounds of initial and final consonants. This book prepares students for reading and writing through letter formation, tracking skills, and phonemic awareness activities. Book C teaches students consonant sounds c, g, l, q, v, w, x, y, and z with an emphasis on phonemic awareness and sound-letter correspondence. Grades Pre-K-1. 110 non-reproducible pages, consumable softcover workbook. Get Ready for the Code: consonants b, f, m, k, r, and t.
Get Set for the Code: consonants p,j,h,s,n, and d.
Go for the Code: consonants c,l,g,w,y,v,z,q, and x.
Workbook 1 introduces students to the sounds of short vowels. The exercises begin with short a and then follow with short i, short u, short e, and short o. Students practice blending sounds to read and write CVC words. Workbook 2 introduces students to the sounds of initial and final consonant blends. The exercises begin with beginning l blends and progress through to final blends. Students practice blending sounds to read and write one-syllable words. Workbook 3 begins with words that present y as a vowel, then progress to long vowels with silent e, and finally to consonant and vowel digraphs. Students practice blending sounds to read and write one-syllable words that include digraphs and long vowel sounds. Workbook 4 introduces students to compound words, common endings, and syllable types. Students learn that compound words are made up of two smaller words that when put together make a word with a different meaning. They practice adding the endings –ful, -ing, -est, -ed, and -ness to make new words. Workbook 5 introduces students to the word endings -ed and -ey, word families including all-alk, old-olt-oll, ild-ind, the digraph qu, and 3-letter blends. Students practice blending sounds to read and write multisyllabic words. 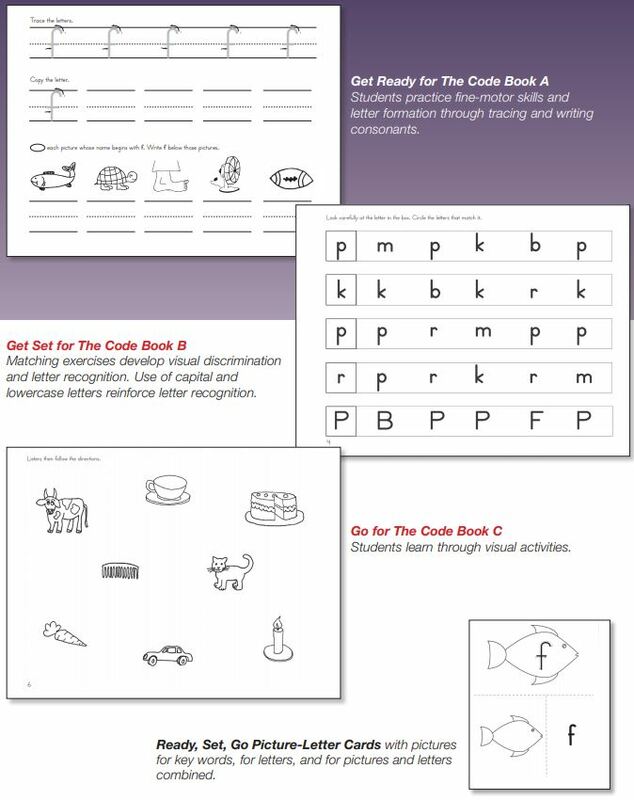 Workbook 6 introduces students to the r-controlled vowels, silent letters (-igh), and vowel diphthongs. Students practice blending sounds to read and write multisyllabic words. Workbook 7 introduces students to the sounds of soft c and g, silent consonant patterns such as -dge, -mb, kn, wr, and silent t and silent h words. In addition, this book teaches the sounds of ear, ei, eigh, and ph words. Students practice blending sounds to read and write multisyllabic words and phrases. Workbook 8 introduces students to more complex morphemic units including suffixes and irregular endings. Students combine word parts to create multisyllabic words and increase their vocabulary by learning the meanings of common suffixes and endings. All workbooks have several review lessons and a posttest. Reinforcement and extra practice is available in “half workbooks” that correspond with workbooks 1-6! A four-book series that helps students develop important comprehension and thinking skills at the earliest level. The books contain charmingly illustrated stories with exercises following the same phonetic structure as the Explode The Code series.